SURFER JOE MUSIC exists in Italy since 2002 to promote surf music. 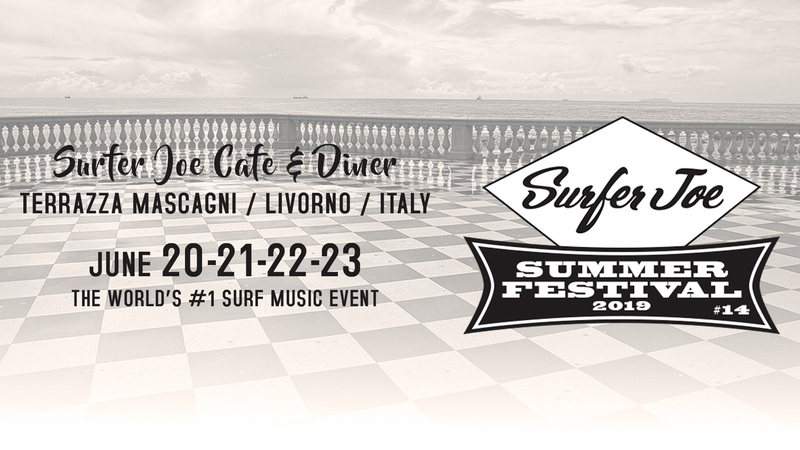 SURFER JOE SUMMER FESTIVAL, the world's #1 surf music event. Yes, we will do it again! The dates are confirmed and it's going to be again a mega party dedicated to instrumental surf music, tiki, and fun. The program will be available soon and you will be able to read all details as usual at the Festival's web site. Surfer Joe Music deals with the booking of surf bands and the organization of surf events. We usually book directly or collaborate with other agencies and promoters. In any case we try to be very realistic on the possibilities that the market offers. Surf is generally and historically considered an instrumental music genre derived from jazz, rock 'n' roll and blues, born in southern California at the very end of the 50s and largely diffused all over the US between 1961 and 1965. The music has since then spread out anywhere and Surfer Joe is just an example of how global and intense surf music's production is today with new surf bands growing and developing every year. Surfer Joe helps surf music to never die. Some people think surf music had a very short life in the beginning of the 60s in USA, but they are obviously wrong. Search online for "surf music" and you will find a lot of sources to tell you the stories and facts of this original Californian movement and its great diffusion everywhere! Selling the albums and merchandise of surf bands is a "natural" extension of our business. So we opened the store in late 2013 to showcase the new productions from around the world. We sell the releases from most of the labels specializing in surf music, especially instrumental, plus we stock classic albums and even used CDs and LPs from private people. We are going to have for sale one of the largest selections of surf music and we try to work for the surf fans locating for them rare and difficult to find albums. Through a very easy and understandable interface, we offer worldwide shipping using postal services and couriers at the best rates possible. Our headquarters are in Livorno, Italy, at the American diner and tiki bar that we own. We weekly organize concerts and cultural activities involving many music genres other than just surf music. The diner is actually the one and only existing dedicated to surf music and showcases many posters and memorabilia from events that we have managed during the years and various collectibles.